Because Clicky is focused on real time data, by default all reports will show you "today". Your historical data is also available, of course. Simply go the report in question, then use the global date menu in the top right corner of Clicky to change the date range you are viewing. 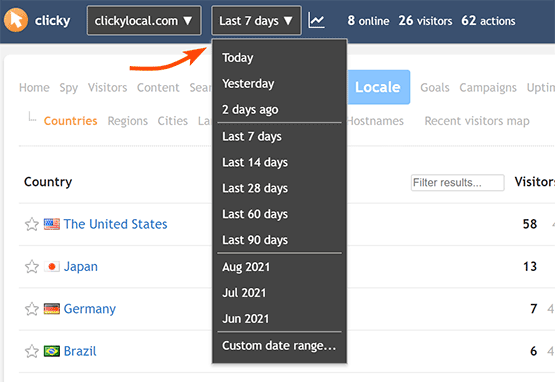 Some commonly used options are displayed, but you can view a custom date range by clicking the "custom date range" item at the bottom of the date menu. You will then be presented with a calendar to select the start and end dates. When viewing a range of data, the trend percentage represents the trend vs a similar previous period. For example if you choose the last 14 days, the trend will be vs the 14 days before that. As you browse around further reports, the date range you have selected will continue to apply to those other reports. Do note that the larger range of data you view, the longer reports will take to load. We recommend changing back to "today" as soon as you are done with historical analysis, so other reports will load quickly. When you graph data, most of the time you will see the last 28 days of data by default, but you can change that too. Learn about graphing and date ranges.